This weeks photo is of two recently fledged Barn Owls about to take their first evening flight. It is only a record shot taken from the car more than 400 yards away and these two were part of a brood of six that fledged from a barn just a few yards away. 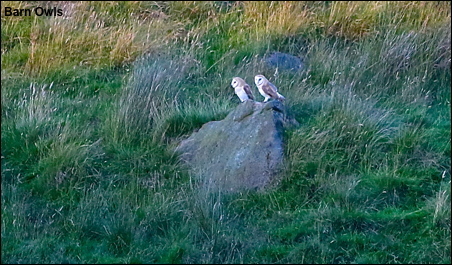 The significance of the photo is that with these Barn Owls I have, in the last two months, now photographed all five species of Pennine Owls something I have never done in one season in forty seven years before.